Pasta has become a classic American staple. It’s origin maybe Italian but in the past 50 years, it’s become one of the go-to easy dinners that many families enjoy at least once a week. My grandmother didn’t have many pasta recipes. The few that she had remained part of her unpublished recipe set that she developed later in her career. The trendiest dishes of the 1960’s, when her cookbooks were written, were of mostly of French origin. The pasta explosion came later. Even so, it’s become so common that there are many pasta dishes that can now be considered classics. These include dishes like spaghetti and meatballs, mac and cheese, lasagna, and some cases chicken parmesan (or parmigiana). In most Italian red-sauce restaurants, the chicken is really the focus of this dish and pasta is really a side, if included at all. I’ve always preferred a more equal balance of protein and pasta. And although I enjoy a good chicken parm, I am also a seafood lover and found this deconstructed shrimp parmesan to be the perfect lighter alternative to the original red-sauce classic. This recipe is fairly simple but be prepared to dirty more than a few pots and dishes. Fresh shrimp are lightly breaded and then sautéed (not fried) until just barely golden and tender. 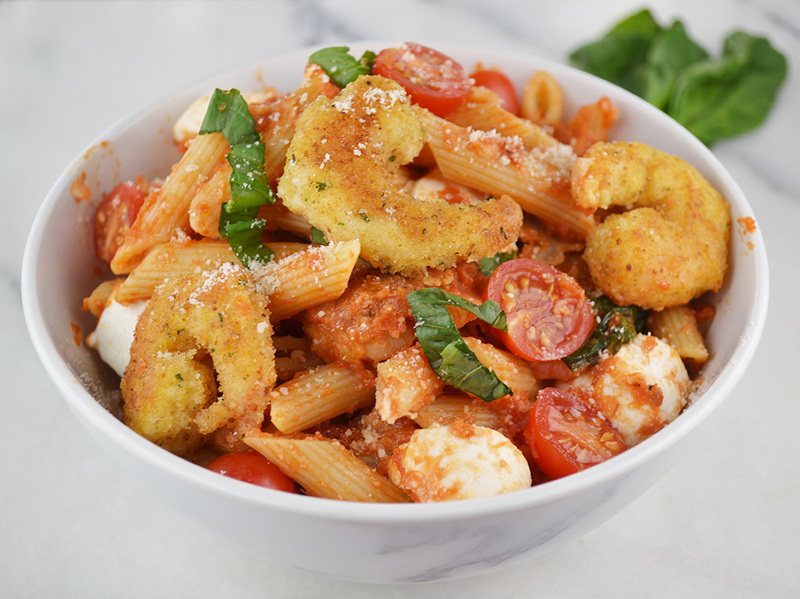 The shrimp are then mixed into al dente penne pasta (feel free to use whole wheat or grain) combined with homemade simple tomato sauce and fresh basil. Store bought tomato sauce can be used as a shortcut but making your own is so simple and inexpensive, I highly recommend it. Finally, toss in fresh mozzarella, parmesan cheese, fresh cherry tomatoes, and basil to make a caprese salad parmigiana mixture that’s not only fresh but bursting with Italian-American flavors. Preheat a large wide saucepan over medium heat. Add 2 tablespoons of the olive oil. When almost smoking, add onion, garlic, and red pepper flakes. Saute for about 5 minutes, just until onion is translucent. Add crushed tomatoes and stir. Bring to a boil then reduce to a simmer. Season with salt and pepper and oregano. Allow sauce to simmer over low heat while you prepare the shrimp and pasta. Place flour with a little salt and pepper in a separate bowl or pie plate. Crack eggs into a bowl and beat with a fork to break up yolks. Place Mix bread crumbs with a ¼ cup of the parmesan in a separate bowl, pie plate, or baking dish. Working in batches, dredge shrimp in flour, then egg wash, and then in the seasoned bread crumbs, tossing to coat evening and shaking to remove any excess. Place on a plate until ready to cook. Heat a pot of bowling water and prepare pasta according to package instructions. Meanwhile, heat a large sauté pan over medium-high heat. Add remaining oil. When oil is almost smoking, add shrimp in batches. Brown 1-2 minutes on each side, careful not to overcook. Remove and place on a separate plate. Tear or chiffonade basil leaves. Add about half to the sauce and stir. Remove sauce from heat and add drained pasta. Mix well. Stir in remaining ¼ cup parmesan cheese, ciliegine, cherry tomatoes, and shrimp. Serve hot with remaining basil.